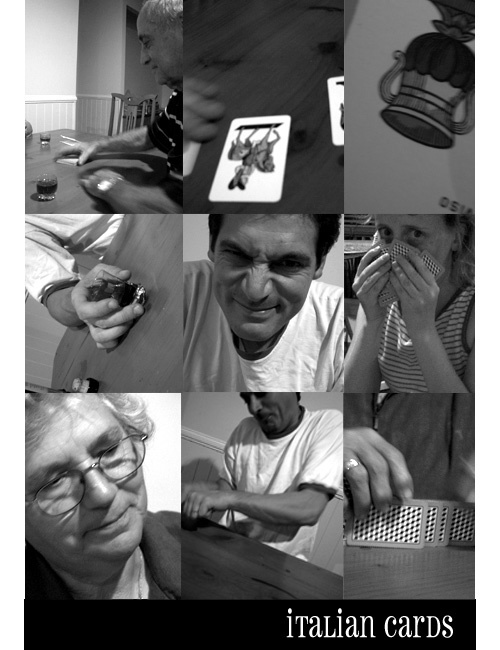 Playing cards with the Italian in-laws and drinking port. Yep that is my hubby with the 'we just lost' look on his face and then doing a dance when he won the next round. And that is me....dark circles under my eyes, unbrushed hair...the essential mother look, just in case you didn't know. There is a reason you can change things to greyscale! My mother and father in law also. I always play with my mother in law and 9 out 10 times we win! I don't have too much to say today. My inlaws have arrived for a few days so I am going to take this time to clean my study and get through some paperwork...hopefully creating some illustrations too, then sleep. Poor Miss M is having a real battle with teeth still and has a roaring temp even with paracetamol to help. We are keeping a close eye on her. 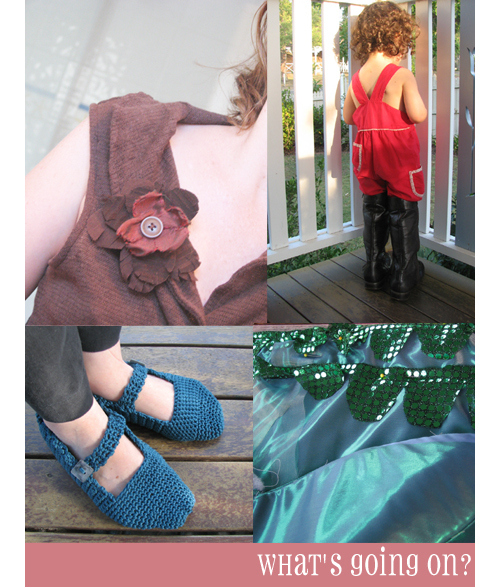 My first parcel has arrived to my swap partner so I can showoff some of the creations I made. The elephant and dog on the surfboards are 2 illustrations for her sons. More detail can be see on my flickr page. The cube isn't for her...it is an addition to the house. Thank you , thank you to all the lovely suggestions you made and comments. I'm glad I have met some new bloggers too. OK all you sofite makers out there. I need some help! I'm trying to make a gift for a pregnant friend's baby. I have been inspired by these amazing cubes. 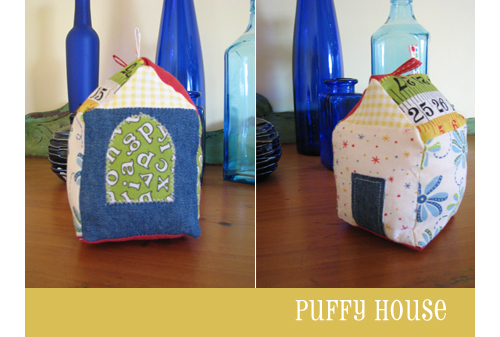 Instead of cubes I thought I would be clever and make some little houses. Of course I know I'm not patient with 3D craft but I had this image in my head and just had to make it. I've tried to find something similar out there but to no avail. The thing is they seem too puffy to me. Yes? No? I'm trying to get the right amount but it just ain't working. 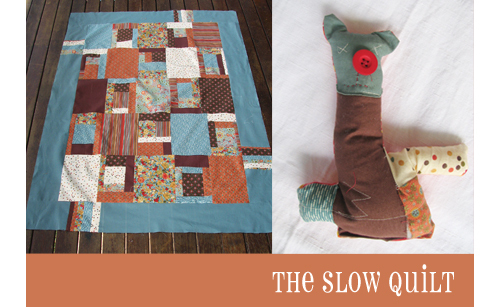 Earlier this year I blogged about a new quilt that I was making. I'm still making it, haven't forgotten it. I'm really good at finishing projects for a reason. Be it a present for someone, a project I'm involved in or even yes paid work...this is always incentive to complete a task. Otherwise they get stored into my WIP box until the mood strikes me again. Since that post about the quilt, I was contacted by a lady at Country threads magazine who really wants to include it in one of the editions later this year. HOLY COW! I'm no pro. 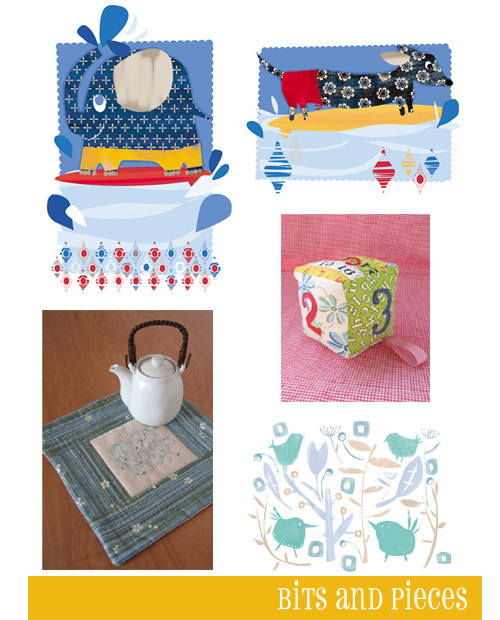 I've had a couple of lessons and I shudder at the thought of 'real' quilters seeing my work. But you've got to give these things a go, right? So I have finished the top and just need to have it quilted. Yes, I think I will outsource the quilting on this one so it actually looks nice! The scariest part of all is that I have to submit some instructions and measurements to them. I hope my frizzled toddler brain will be able to write down some sense. Oh, and the other reason it has taken me so long to finish, (It really is a quick quilt to make) is because I have 2 small children. It seems that every time I want to paint, they want to paint, every time I want to sew, they want to sew. This 'thing' on the right was artistically directed and designed by Mr A. i.e. 'cut this here mummy' 'sew that bit there mummy'. Meet Mr Hoppy. he has only one leg (that is the orange bit on the right) and the letter M sewn on his tummy. It was initially a gift from Mr A to his sister Miss M. However he was very reluctant to give it up when I had finished him. I think it has become a shared toy now. Mr A even did some hand sewing...yes the bit where the stuffing is falling out! I just completed a swap with Laura from Jellyspecs. Sadly she no longer has a blog site, but does have a flickr account with some great things to see. I received..we received..the most amazing package of goodies. She made the most devine apron for me. I'm too scared to wear it when cooking for fear of it getting dirty. In addition to what is below she sent many other wonderful presents including some Jill Bliss stationery. I love it all and thank you. In other news I managed to create some new artwork for the shop. I'm feeling a little over BIRDened! I love drawing and painting birds, but I have an itch to explore something new. So stay tuned, you might be seeing something new soon. This week is dragging, yet it feels like Friday not Wednesday. Miss M is finally and very slowly getting her 2 year old molars...HELLO...you are almost 3!!! So many a late night with screaming child have been on the cards. Today is my sister's birthday and she put her orders in for a pair of slippers from this pattern. I'm getting so quick at these. The rest of my week has been spent with the usual work but I have also been finishing swaps, making autumn flowers for me, and thinking ahead to the screaming child's 3rd birthday next month. Any guesses as to what kind of a party she wants to have?? Don't ask me about yellow...it just hasn't been happening this week! 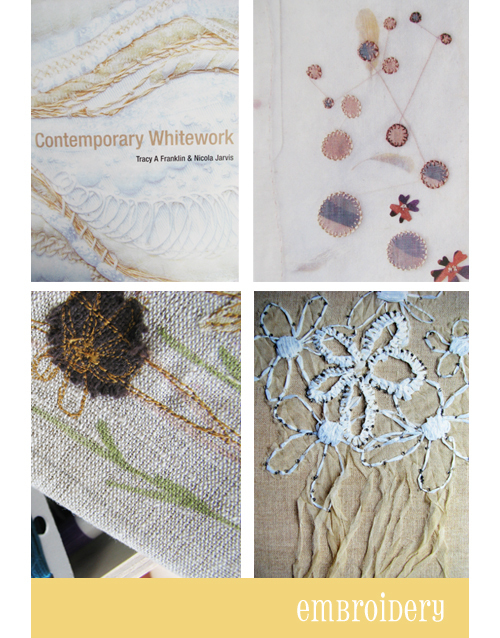 I'm exploring this wonderful book Contemporary Whitework. I spied it at my local library and it is full of the most amazing embroidery that showcases a variety of stitch techniques and contemporary styles. The bottom left image is something I am working on but I cannot reveal anymore until finished. It felt like somebody turned the oven up over our city for a few days last week. But thankfully, it seems to be over. Only 28 degrees C today! I'm not much of a gardener because I suffer from rhinitis, however at the beginning of autumn, winter and spring I often feel a need to mend my garden. This often involves taking out things that are dead and replacing them with something new. So today, we went and bought some plants that require little watering. I love succulents. Master A loves gardening and is desperate for us to have a vegie patch like his nonni do. He spied some strawberry plants at the nursery so please everyone keep you fingers crossed that I won't kill these before they bare any fruit. He'll be so sad if he doesn't get any. What else is happening? 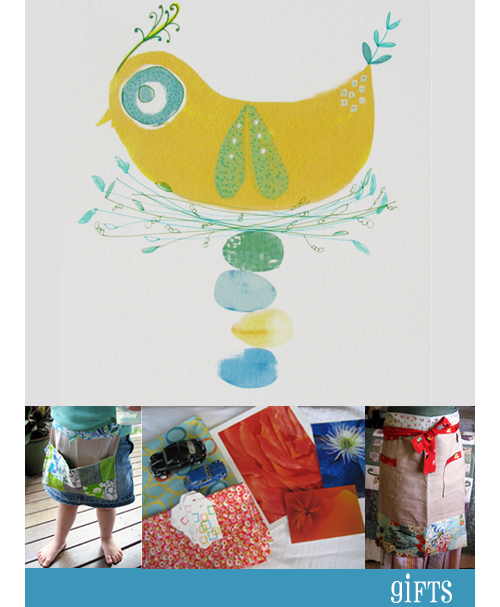 Well thank you to everyone who bought and commented on my yellow tweety bird cards. They sold so quickly. I will be posting these tomorrow to you all. My washing machine finally and thankfully died yesterday. Just like that, no warning, it was a sudden passing. It is a small machine we bought pre kids so a bigger one will be such a blessing. So tomorrow I will also be out looking for a new one. Piles of clothes are growing in the laundry as I type this. My question is, front or top loader? I have never owned a front loader, but I do know they are far more water efficient. Do they take longer? HELP. What do you use? 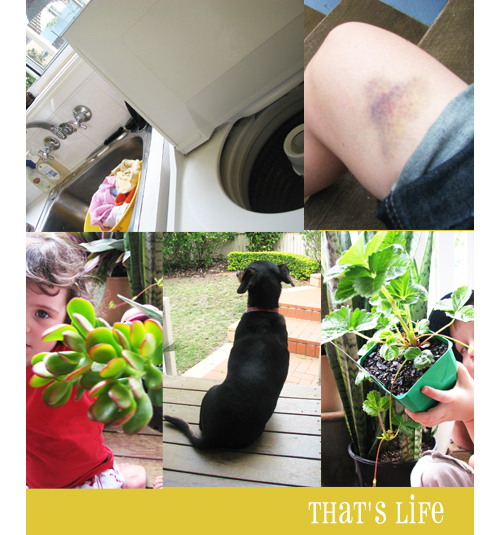 And see that bruise on my leg! What a whopper. It has come out in the shape of a love heart. I got it from trying to race Mr N on a kid's peddle bike. The handles kept on bashing my leg. I think I need to grow up a little....or get a bigger tricycle. 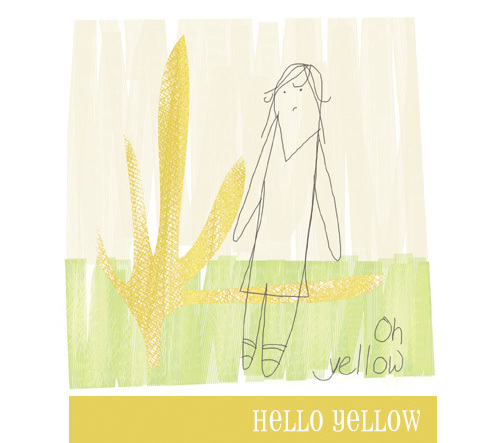 I seemed to get over my yellow woes this weekend and had a chance to make some new cards. There are 6 in a pack and are in the shop now. More can be seen on flickr or at the shop. I have sewn the images onto the card. 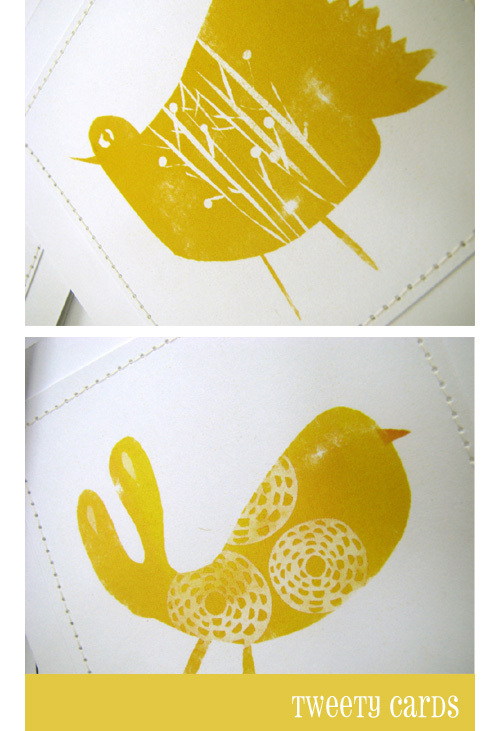 And I actually am surprised that I like these yellow birds, I could have kept on drawing all day! And thank you to Stephanie for this lovely swap. I swapped one of my earlier yellow pieces I created in the year for some of her work. It was a lovely surprise, plus all the other goodies she popped in. So far this colour has failed to charm my enthusiasm to create something I am happy with. I'm talking illustration/painting here. I'm in the mood to paint, but everytime I squeeze out some butter or golden pigment I don't know what to do with the brush. So I add another colour and then another and then another and before I know it I have a blue image with a speck of yellow! Perhaps I should continue finishing that slipper. I found this interesting page from a mac user who thinks differently to me. Enjoy your weekend.